Why Does Crime Increase During the Holidays? It may seem that the topics of ‘crime’ and ‘Christmas’ only overlap in the film Home Alone, but statistics have shown that life does imitate art in this case. It appears that ‘silent nights’ see a spike in criminality. There is a wide variety of crimes that increase during the holidays, including identity theft, home break-ins, online shopping scams, fake charitable pleas and phishing emails. The question is, why? What compels the increase in crime or the suspicion that crimes are committed more during the holidays, and does this trend hold true in New Hampshire? At Tenn And Tenn, P.A. we know both that the conditions during this time increase temptations to commit some acts, such as theft, but we also know that conditions are ripe for police to wrongfully suspect someone of committing a crime, even when no crime was committed. Social scientists, criminologists and law enforcement have characterized holiday crime spikes as “crimes of opportunity.” The first rational basis why crime increases during the holidays is simply because crime increases, period, on days off. Inhibitions are lower, people drink. They are more likely to leave their homes for outings, vacations and family trips – leaving their homes vulnerable to prospective intruders . 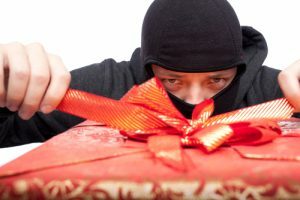 Coupled with the fact that financial stress and pressure to provide increases during the holidays, it seems there is a perfect storm created for holiday crime. Both commercial and home burglary are more common during the holidays, with the increased customer flow directly leading to more hand cash in the till. The National Crime Victim Survey shows that robbery and personal larceny are the two crimes which see a measurable increase in the month of December. In addition to commercial/retail robberies, mugging or personal larceny are also more common because, beginning Black Friday, people tend to carry more cash on them. Parked cars are also more likely to contain valuables such as newly purchased TVs or game consoles, for example. During this holiday season, there is also the risk of wrongfully being accused of any one of these crimes. People and police alike are on high alert during this season, and if they notice anything that may appear suspicious to them, they automatically assume the worst. Regardless if you committed a crime or not, you will likely find yourself being booked into jail. It’s a problem, and one that we fight everyday at Tenn And Tenn, P.A. Regarding cyber crimes such as stolen identities or credit card numbers, there is an increased opportunity for such crimes, beginning with Cyber Monday at the end of November – the day that more or less kicks online holiday shopping into gear. Although online retail giants like Target and Amazon generally have airtight security to protect customer’s credit card information, lapses can and have happened, jeopardizing the information of millions of customers. Furthermore, the burst of online shopping carries the risk that customers may arrive at an un-secure site and unknowingly release their payment information on an un-encrypted page. If you work at one of these companies, like Target or Amazon, you could potentially become a suspect. Almost 50 percent of the time, cybercrime is committed by an insider. If you are a disgruntled employee or the opportunistic type, then you may come under suspicion. Regardless if you committed or not any kind of cybercrime, you will need an experienced criminal defense lawyer. New Hampshire specifically has long been dealing with an opioid crisis which, although not specific to the holiday season, may contribute to the general trend of crime during this time period. Like the rest of the country, New Hampshire sees a spike in crime during the holidays for all the same aforementioned reasons, too. There is no exception to be found in New Hampshire, including the rise in misplaced suspicion that a person may have committed a crime when he or she did not. To that end, always be mindful of where you are and who is around you. What many fail to realize about crimes, including those who commit them or those simply accused of committing them, is that criminal accusations are far from straightforward. They are not cut and dry, and not all those accused of committing a crime are guilty. Normally, a complex set of circumstances happen in the lead up. Anyone charged with a crime in the state of New Hampshire requires an experienced attorney who appreciates the nuances of criminal charges and the circumstances of those accused. If you have been accused of committing a crime in New Hampshire, contact a New Hampshire criminal defense attorney immediately for a free consultation. The legal team at Tenn And Tenn, P.A. are prepared to review your case and fight for your rights in court.